About twenty years ago, I had a part-time job in college working at an upholstery fabric and foam manufacturing company; the same company where my grandfather had worked until retirement. My job was primarily to make phone calls to small 'mom & pop' upholstery shops all around the state and check on their supply needs. I also covered the front desk and sales floor during the lunch hour of the salesman, and one day something especially memorable happened. One of the company's regular customers came in to pick up an order, and little did I know, she was rumored to be a psychic. (Yes, you read that right!) The salesman returned from lunch right at that time and officially introduced me to the customer, adding in this little known fact. I was very skeptical, and I thought the salesman was pulling a joke on me since he was known around the office as a prankster. But I went along with the two of them, and the supposedly psychic customer offered to tell me what she could "see" about me. Even though I doubted there was any truth to it all, I decided to play along, but just in case, I also told the woman that I didn't want her to tell me anything specific, like, how/when I would die, or something significantly fateful. She said that it was her policy not to reveal any of those sorts of things that might alter how someone would live their life. Instead, she told me that she saw something about me that had to do with time. She said she couldn't be sure, but she thought maybe I was especially concerned with time, or stressed about a lack of time, or something like that...but whatever it was, she "saw" the image of a clock. Now, to be honest, I really didn't put any stock into the things she said that day. I was a college student trying to manage a full load of classes and a job. It didn't take a psychic to recognize that I was concerned with time! 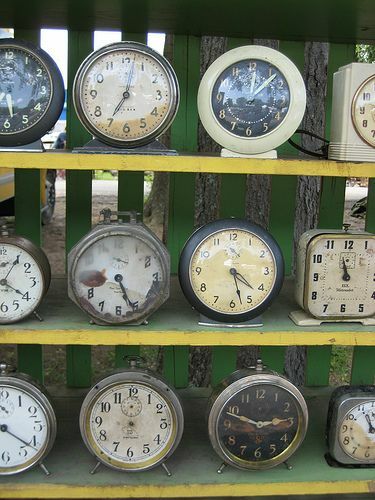 But, then again, maybe what she really saw that day was how much I loved clocks. I always have. There is something about the craftsmanship, as well as what they represent in our lives, that I find interesting and incredibly beautiful. When my husband and I were first dating, we both coincidentally gave each other timepieces for gifts on our first Christmas together. When my sister got married, I gave her and my brother-in-law a wall clock as a wedding gift. And I have lovingly carried an heirloom mantel clock from my family with me in every home where I've ever lived. We have clocks all over our house. Not primarily because I'm concerned with what time it is, but rather because I love them as pieces of art. And, when it comes to the vintage ones, I love that they are pieces of history, too. While we own a variety of styles made by many different manufacturers, I recently began collecting Westclox, and I think they are something truly special. After reading this guide, I hope you'll think so, too! Disclosure: This is NOT a sponsored post, and I have received NO compensation for sharing any of these products. Some links to products that follow may be affiliate links, and I might earn a commission if you make a purchase through that link. This usually amounts to cents, not dollars, and helps to support the projects featured on this blog. I only recommend products from companies that I have found to be trustworthy. Read my full disclosure here. In late 1885, Charles Stahlberg patented a new type of clock mechanism and formed the United Clock Company in Peru, Illinois to manufacture his new invention. Very shortly thereafter, the company went bunkrupt. Just over a year later, the company tried to reorganize under the name Western Clock Company, but again, went bankrupt quickly. In 1888, Frederick Matthiessen bought the company and decided to try once again by reopening the company as the Western Clock Manufacturing Company. Matthiessen was the mayor of LaSalle, Illinois--just 6 miles down the road from the Peru manufacturing plant where Stahlberg had tried to open twice before. And this time, it worked! 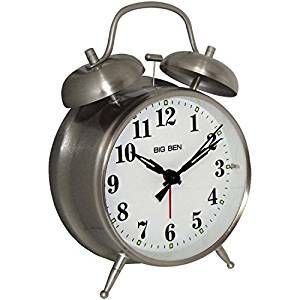 This small clock was so significant to US history because it was the first mass-produced alarm clock in the country, making it available to more Americans at a price people could actually afford. 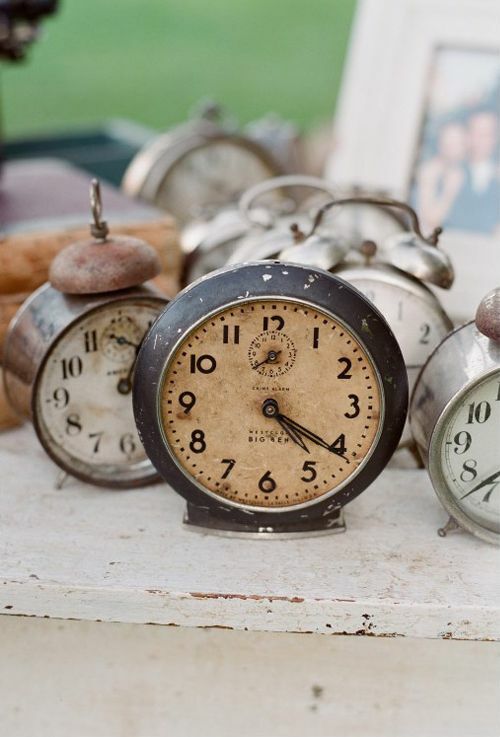 It's hard to imagine that just 100 years ago, an alarm clock was a luxury item that wasn't readily available to everyone the way they are today. The company produced up to 35,000 timepieces per day and became THE name for clocks and pocket watches in the US. But in 1942, things took a different turn. 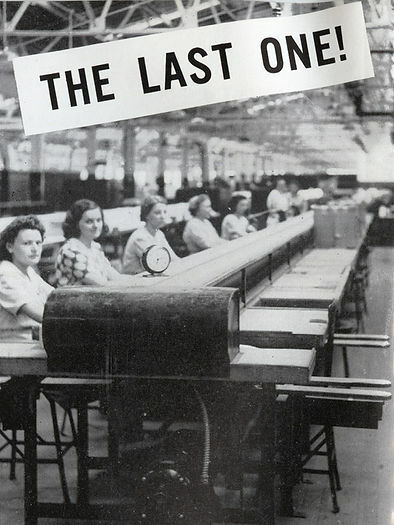 During WWII, many manufacturing companies stopped producing their usual products and began contributing to war efforts. The Ball Mason Company was another that I've told you about, and these stories make for some interesting trivia about these products. 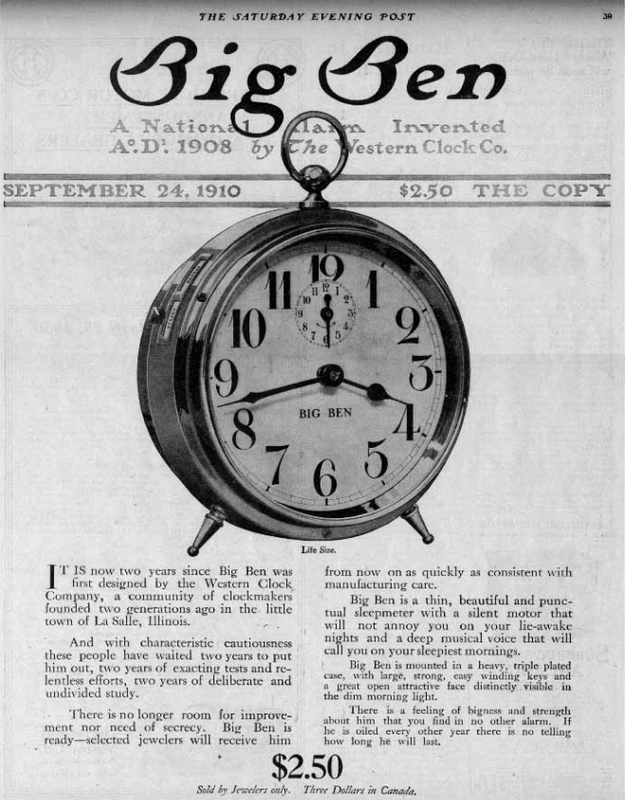 Westclox came under the authority of the War Production Board (WPB) and produced their very last Big Ben clock during the duration of the war on July 31, 1942. 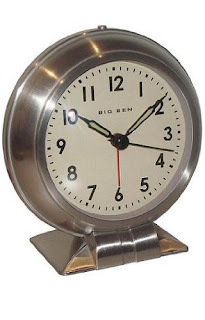 Within a year, the WPB decided that there was a shortage of clocks and commissioned Westclox to manufacture an affordable clock, but they had one stipulation--instead of the 300 pounds of brass normally used to produce every 1,000 clocks, the WPB would only allow 7 pounds. Metals were scarce during war time, and these were the kinds of compromises Americans were forced to make to support the nation's efforts. 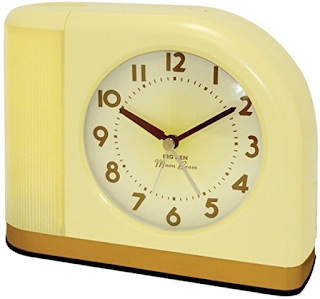 In response, Westclox created a line of clocks called the Waralarm. If you find one, you have a unique piece of history! The Waralarm is made of "lacquered moulded wood fiber" (a.k.a. cardboard), and stands 5-5/8" tall. 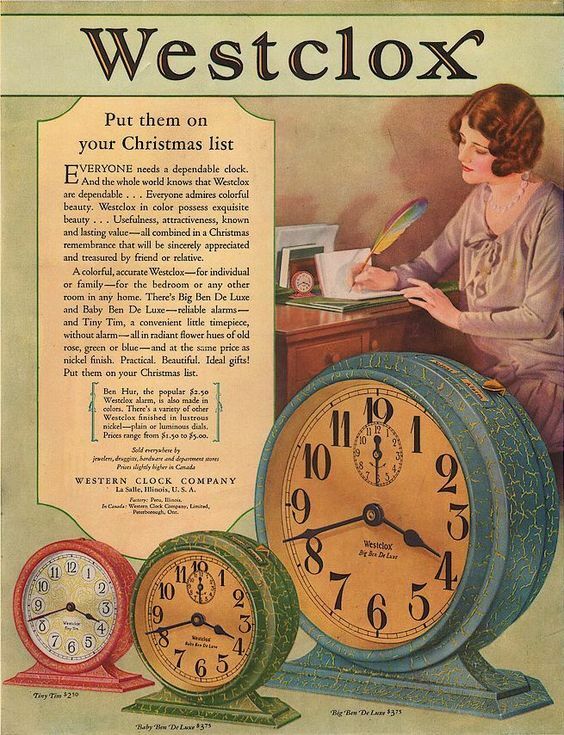 The Westclox name does not appear on the clock, but you will find the "Made in LaSalle, Ill USA" notation on the face. 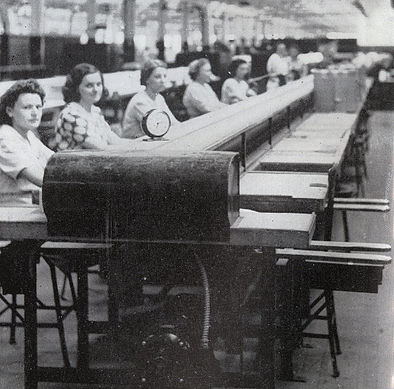 The WPB completely controlled how many clocks would be made and shipped to jewelers around the country. The Westclox museum tells the story of what happened when a shipment of clocks arrived at a Chicago store. Although the store normally opened at noon, customers were queued up at 8:30am. When the doors opened, a mad rush like what we have seen with modern day Black Friday sales occurred. People were trampled, windows were shattered, several women fainted, and police were called in to manage the crowd of 2,500 people trying to get their hands on one of the 1,500 clocks available. I would be so delighted to someday find one of these special pieces of American history, but no matter how you begin your Westclox collection, the following should be helpful in identifying what you have. 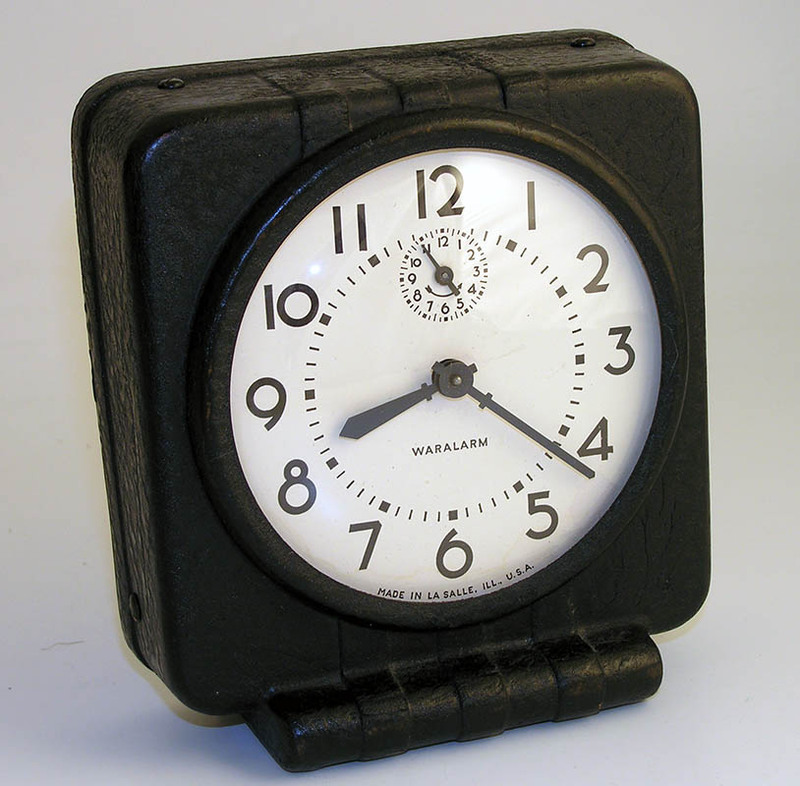 Because there are so many varieties of Westclox clocks that have been made over the past 100+ years, I cannot begin to address them all in this brief post. However, Bill Stoddard has been collecting and archiving information about Westclox for nearly his entire life since he began collecting clocks at the age of 8 years old. His guides are the most comprehensive resources you could hope for, and he has loads of information to share. I suggest beginning by reading this short guide, then find tons of more detailed information on every different type of Westclox clock (and others!) on Bill's website. If you really love Westclox, like I do, you might also consider making a trip to the Westclox Museum in Peru, Illinois too. 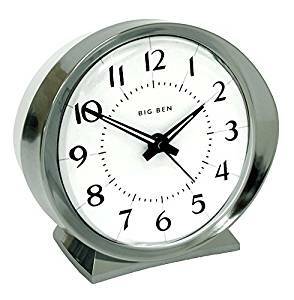 What follows is a brief overview of the 10 varieties of Big Ben and Baby Ben models made by Westclox, based on Bill's research. These are two wonderful models to begin your collection! If you're hoping to determine the approximate age of your Westclox clock, there are two ways to do so. First, Westclox date stamped the movement (i.e. the inner metal parts of the clock) until the late 1970s. Through the mid 1930's the date stamp included the month, day, and year. After that, only the month and year were noted. However, this is a more difficult way to determine the date of your clock as it involves taking the clock apart--something that is risky for the average collector. Taking your clock apart may ruin it and, in the process, destroy its value as a collectible, so only do this if you are an expert! 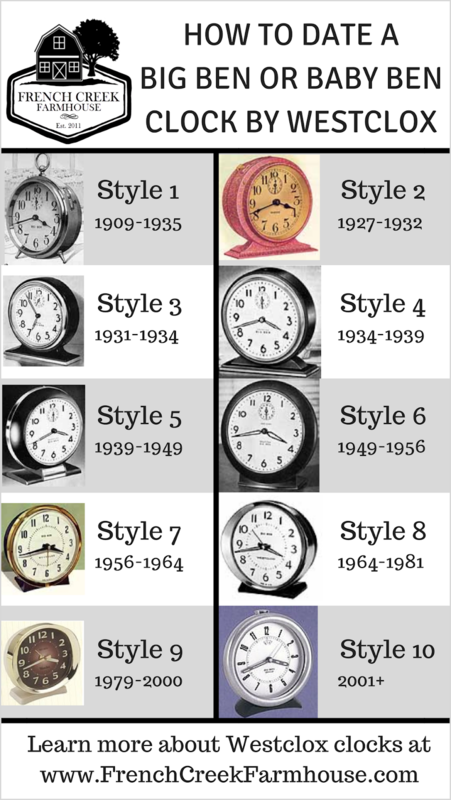 An easier way to date your clock is by looking at its style to determine the approximate age. 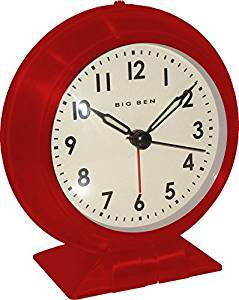 There are 10 basic varieties of the Big Ben and Baby Ben models (as well as a few miscellaneous styles), and I've created a pinnable image that you can save to reference when you are hunting for treasures. The color of the clock will not help determine the age. Look at the shape instead. Baby Bens are (generally) just smaller versions of Big Bens, with a few exceptions. 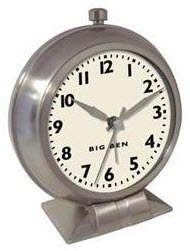 In 2001, reproductions bearing the name "Big Ben" came onto the market in different styles than had been seen in the past. Reproductions are battery operated and made in China. There are approximately a half dozen styles of related Bens beyond these 10 mainstream styles. You can find more information on those here and here. If you are looking for more detailed information about a specific clock and its age, I highly recommend using Bill Stoddard's website to further pinpoint the exact model you have. 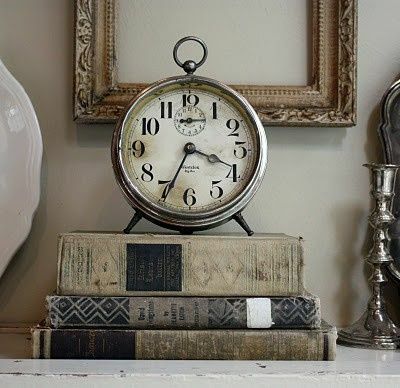 Looking for the classic style of an antique or vintage Westclox clock at an affordable price? Here are a few great looking reproductions. 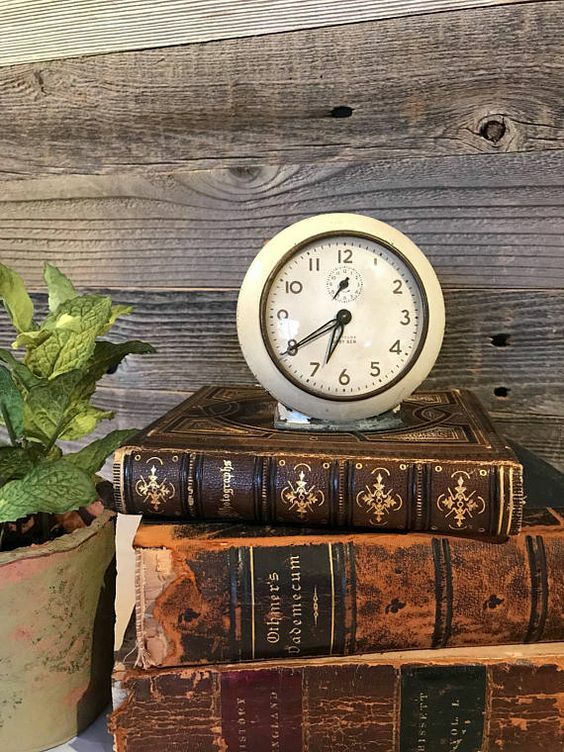 What is the oldest Westclox clock in your collection? Do you have any great stories about your collection? I'd love to hear about it in the comments below!